Denise Null Thompson is from Mayfield/Graves County. Denise graduated from Marshall County High School and Murray State University. She previously worked for Sun Publishing owned by The Paxton Media Group of Paducah. Denise is married to Jordan Thompson and has three children, Sam 17, Jack 15, and Jenna Leath, 13. She also has one dog named Charlie and two cats named Jim and JoJo. Denise spends her free time attending ball games and other events her children participate in. Working at the Chamber is important to Denise because she enjoys helping her friends, neighbors and colleagues grow their business and excel at what they do. Katie Wooley is a life long resident of Graves County. Mrs. Katie is a graduate of Wingo High School, class of 1963. Mrs Katie was originally a teacher’s aide, but the principal at Wingo Elementary convinced her to go to Murray State to get a teaching certificate. Mrs Katie went on the get her degree and teach at Wingo for 27 years. 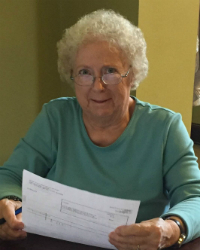 After retiring, she continued to be a part of the school system by becoming a volunteer at Wingo, and Fancy Farm Elementary as a Reading Buddy. Katie has continued her volunteerism at The Chamber of Commerce, and has been a constant source of support for the past thirteen years. Katie is not married, and has no children. Her hobbies are reading mysteries, knitting, and traveling. She has been to all fifty states, and even some foreign countries. She collects chickens, churches, hand held fans, and wicker baskets.